Spray liberally onto gums, tongue and lips as often as required. Aqua, Maltitol, Xylitol, Sorbitol, Hydroxyethylcellulose, Sodium Benzoate, Sodium Methylparaben, Potassium Sorbate, Potassium Chloride, Citric Acid, Sodium Chloride, Sodium Propylparaben, Dipotassium Phosphate, Sodium Monofluorophosphate 0.114% w/w (150 ppm fluoride ion), Sodium Saccharinate, Calcium Chloride, Magnesium Chloride, Colostrum Extract, Lactoperoxidase, Lactoferrin, Lysozyme. Your saliva is essential to safeguard your general health and wellbeing. Saliva plays an important role in everyday life; it provides a protective barrier against the bacteria which can enter your body via your mouth; it helps to speak, chew, swallow, taste and digest food. In addition, by regulating the pH in your mouth, saliva also protects the condition of your teeth and gums, neutralizing the acids which can lead to dental plaque and caries. Causes of Dry Mouth? There are numerous factors which can cause a reduction in the quantity or quality of saliva and consequently disturb your mouth’s protective antibacterial mechanisms. Head & neck radiotherapy or surgery, autoimmune disorders such as Sjögren’s Syndrome and more than 1800 commonly prescribed medications (anti-depressants, antihistamines, anti-hypertensives, anti-inflammatory, anti-parkinson, etc.) lead to a dry mouth. Stress and the ageing process can also be contributory factors. Consequences of Dry Mouth? As a result of the loss of natural moisture, speaking, chewing and swallowing can become difficult. Dry Mouth, and the consequential decrease in salivary protection, can also lead to a number of significant oral problems (bad breath, dental plaque, caries, inflammation of the gums, ulcers, receding gums or even tooth loss). These distressing and painful symptoms can severely affect your quality of life. Your Dry Mouth remedy? Your first priority is to reduce the uncomfortable symptoms of a lack of saliva by providing your mouth with regular, effective moisturisation. It is equally essential to help protect your teeth and gums by replacing the antibacterial systems naturally present in saliva, which have become inadequate or even non-existent. 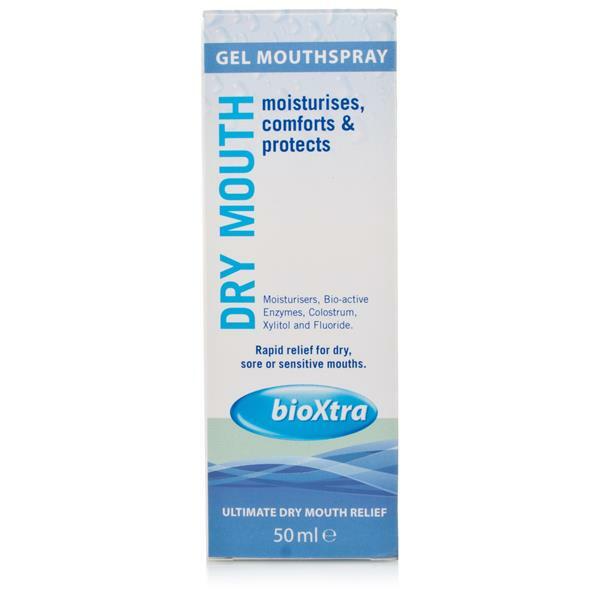 Resulting from the latest research and technology the innovative, patented bioXtra products provide you with an immediate source and sensation of oral moisture whilst helping to maintain your mouth’s natural balance in a similar way to saliva.